Here is an overview of the instruments we made for Partch’s early work. A big thank you to John Szanto, Danlee Mitchell, John Schneider and many others for their invaluable knowledge and experience that they so generously shared with us; to the makers who put their heart in it and to the foundations who made it all possible. Kithara I -2011, built by William Lindhout for Scordatura, supported by Société Gavigniès and Stichting KlankKleurFestival. Premièred in March 2016 at City University, London (BobFest). Mazda Marimba -2017. a group building project: Made by Christian Smalt, Chris Rainier, Harm Mouw, Charles van Gelder, Elisabeth Smalt, Alfrun Schmid, Lucas van Helsdingen. Supported by Société Gavigniès as part of the Rose Petal Jam project. Diamond Marimba -2018. built by Aart Strootman, financed by private donations via Kickstarter crowdfunding as part of the Rose Petal Jam project. Adapted Guitar I was adapted by James Mumford for Chris Rainier in 2013. Adapted Guitar II and III are adapted by James Mumford in close collaboration with Chris Rainier in 2017 as part of the Rose Petal Jam project, supported by Société Gavigniès. Tin Oboe and Tin Flute, 2017. Our versions, used in the piece Yankee Doodle Fantasy, were created by Lucas van Helsdingen and Lucia Mense as part of the Rose Petal Jam project. Harmonic Canon was built in 2018 by David Lavis in close collaboration with Chris Rainier. Supported by Société Gavigniès as part of the Rose Petal Jam project. Adapted Viola – 2002. viola (Palm Guitars) adapted by R. de Jongh in close collaboration with Bob Gilmore. The instrument was made for Elisabeth Smalt as part of the Truth of Tune Tour, the first Partch tour in Holland in 2003, supported by the Harry Partch Foundation. Among the belongings Partch brought to Louisiana [in spring 1930] was the fingerboard from a discarded cello that he had begun to mark two summers earlier in Santa Rosa with ratio indications. In New Orleans in April a local violin-maker, Edwin Benton, attached the fingerboard to a lengthened neck which was then joined to a viola body, creating a new hybrid instrument that Partch called the Monophone, after the name he had given to his tuning system. By 1933 it had become known as the Adapted Viola, the name it was to retain. The instrument is held between the knees in playing, like a viol. Open strings, because of their unconventional length, are tuned a fourth below the usual viola tuning (or an octave below the open strings of a violin); he used cello strings, which gave the best sound. The lengthened fingerboard has twenty-nine indications for ratios within the octave, corresponding to his “1928 theory of the more essential tones”: tiny bradheads have been hammered into the fingerboard at these points beside the strings, so that they act as guides for the fingers of the left hand, not as frets. Pitches other than the twenty-nine indicated are stopped comparatively. 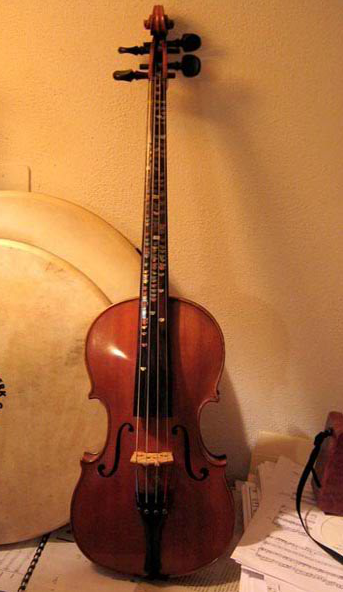 The idea of a new instrument was motivated ostensibly by the desire for a medium that could readily project the full pitch resources of his tuning system, and the two principal adaptations Partch made to the conventional viola—the elongated neck and fingerboard, and the bradheads in the fingerboard—have the same purpose: to permit greater accuracy in the precise stopping of the strings for the microtonal degrees of his scale. More than this, he was free to develop his own technique, one that could grow together with his compositional needs. Partch’s own playing of the Adapted Viola was intended from the outset as a partner or complement to his voice. It clearly invokes the ancient bardic tradition of a singer or chanter of stories accompanying himself on a stringed instrument. His intent was that voice and Viola together form a sinuous couple, with a liquid and sensuous gliding movement, close to human speech, in place of the technique of organ-like “precise discrete steps” into which he felt Western bowed string players were indoctrinated. The “one-finger technique” which he devised is dependent on the careful control of the speed and timing of the finger glides, and on the nuances of bowing.